Live Rome like ancient did over 2000 years ago. 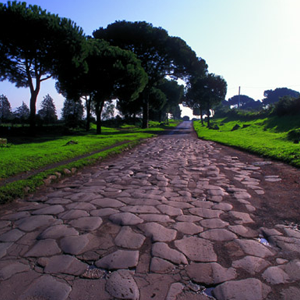 The Ancient Appian Way (via Appia Antica) is one of the oldest and most famous street of ancient Rome. Is also called Regina Viarum (the queen of streets) because it was a strategic street made to move quickly to the important places of the Roman Empire. The road is dating from the 4th century BC and large parts of the original road have been preserved until today. The route is extremely suggestive because you will see some of the most important monuments along the road (Cecilia Metella’s mausoleum, S.Callisto’s catacombs, the Basilica of S.Sebastiano, Massenzio’s villa, Quintili’s villa) riding a street that is pregnant of history with your bike. The path is articolated to reach the Appian Way passing through the Caffarella Park that is part of the Appian Way Regional Park. Inside the park you will see some of the ancient ruins dating from period of 1st/2nd Century AD (The Nympheum of Egeria, Tomb of Annia Regilla, Roman cistern, The Aurelian Wall). The best tour i’ve made in 2015. Thank you MRBike, your rental service is simple fantastic!